Most people, looking at this old wood pile, overgrown with vines and weeds, would think the wood worthless. But someone who knows wood sees the bark and can tell this is some of the finest firewood around. How could wood that looks to have sat on the ground for years have resisted rotting? A few strokes of a splitting maul reveal the yellow wood of a black locust, renowned as a wood for fence posts that last and last. Removing invasive brush around the Veblen House has revealed many old fence posts still intact, likely made from black locust. Update: We had a wonderful spring nature walk at Herrontown Woods on Sunday, April 23. It was Earthday weekend, which is part of Earth Month, Year, Century, and miscellaneous millennia extending out beyond, towards infinite. Earth takes care of people day in and day out, so it's only fair that we return the favor. Below is a virtual version of the walk along the red and yellow trails past vernal pools and boulder fields, all graced with wildflowers and the babble of brooks this time of year, then past the daffodil-strewn Veblen farmstead and over to the Veblen House grounds for refreshments. Head down the parking lot to the Red Trail, and the first thing you encounter in spring is the vernal pools that form in the holes left by trees uprooted by storms. It's fun to search the banks of these pools for the well-disguised wood frogs. It was a weird early spring, with summer-like heat followed by snow-come-lately, but some frogs managed to leave globs of eggs behind. Mosquito wigglers promise a good food source whenever the eggs get around to hatching. It's proving to be an unusually good year for trout lilies--the yellow flowers with trout-like mottling on their leaves. Most years, one sees abundant leaves on the forest floor, but few actual flowers. Spring beauty is a more dependable bloomer. The Yellow Trail branches off from the Red Trail just past the stream crossing, then follows the stream up to a convergence. The opulent leaves of skunk cabbage make these streams a ribbon of green in spring. Take the stone stream crossing to stay on the Yellow Trail. Here's an impressive lean-to someone built, using the crook of a tree to support the central beam. Along the stream is some scouring rush (Equisetum), which we discovered on a walk with kids from the nearby Princeton Learning Cooperative. You can pull apart its segments, and use their abrasive silicon texture to sand a clarinet reed, or scour whatever needs scouring. It's a very primitive plant, and small compared to its tree-sized ancestors from the Carboniferous era. Jack in the Pulpits are getting ready to preach. Rue anemone lines some sections of trail, giving the impression that the edges of trails offer a particularly conducive habitat, where wildflowers are less impeded by the forest leaf cover. We may also see wood anemones and Virginia pennyworts. I'm told that the pennyworts have an S2 designation in NJ, meaning S2, which means "imperiled because of rarity (6 to 20 occurrences)". This speaks to how important it is for us to carefully manage Herrontown Woods to protect its diversity. As the Yellow Trail climbs the slope of the Princeton Ridge, you can see the surrounding understory turning green with, alas, winged Euonymus. That early green flush of species that evolved on other continents can shade out the native spring wildflowers, which depend on that sunlight streaming down unimpeded, to recharge their roots with enough energy to bloom the next year. Native trees and shrubs are slower to leaf out, and so give the native wildflowers the "window of opportunity" they need. Along the trail, you'll see many of the winged Euonymus were cut. We're experimenting to see if the deer will follow up and eat the resprouts. It takes awhile to notice the subtle beauty of flowering sedges. Mayapples are numerous, though relatively few can be found with flower buds. Near the top of the yellow trail, before it swings over towards the quarry area and farmstead, is a favorite spot: the boulder field. A stream flows through the boulders, with enough current this time of year to create a wonderful stereo effect with gurglings of various pitches. These sounds mix with birdsongs, the occasional small plane coming or going from Princeton Airport, and various rustlings of wind and wildlife to create that special seductive serenity of Herrontown Woods. I'd suggest that it was that serenity that drew Oswald and Elizabeth Veblen out to this part of town, and led ultimately to the land being preserved when the Veblens donated it all for public enjoyment. Here's one of the native shrubs--spicebush--which make subtle, fleeting clouds of yellow in the understory. If the shrubs benefit from an opening in the tree canopy, they get enough energy to make bright red, lipid-right berries for the birds. Here's the mystery Viburnum. Only a few specimens at Herrontown Woods. There are various natives--V. prunifolium, V. dentatum, and V. acerifolium--and the nonnative Linden Viburnum. But this is not any of those. Part of the charm of Herrontown Woods is its farmstead (photo below), which includes a small red barn and corncrib, and the shingled 1875 farmhouse known as Veblen Cottage. Many people confuse the cottage with the Veblen House, which is a couple hundred feet away, through the high fence. These daffodils were either planted by Elizabeth Veblen or by one of the local garden clubs that showed their love for the Veblens and Herrontown Woods by caring for the gardens well after Elizabeth passed away in 1974. The daffodils went unnoticed until Friends of Herrontown Woods board member Sally Tazelaar removed all the multiflora rose that had grown over them. The current owner of these buildings, Mercer County, has taken initial steps that, if not countered, would lead to their demolition. They are in fine shape and remind park visitors of Princeton's farming heritage. Our nonprofit, the Friends of Herrontown Woods, has submitted a proposal to acquire and maintain these buildings with the same love and commitment we have shown by taking care of Herrontown Woods for four years. Learn more during the walk, and consider getting involved via our FOHW.org website. It's been particularly satisfying to mentor youth at Herrontown Woods. Various projects have lent themselves well to this. 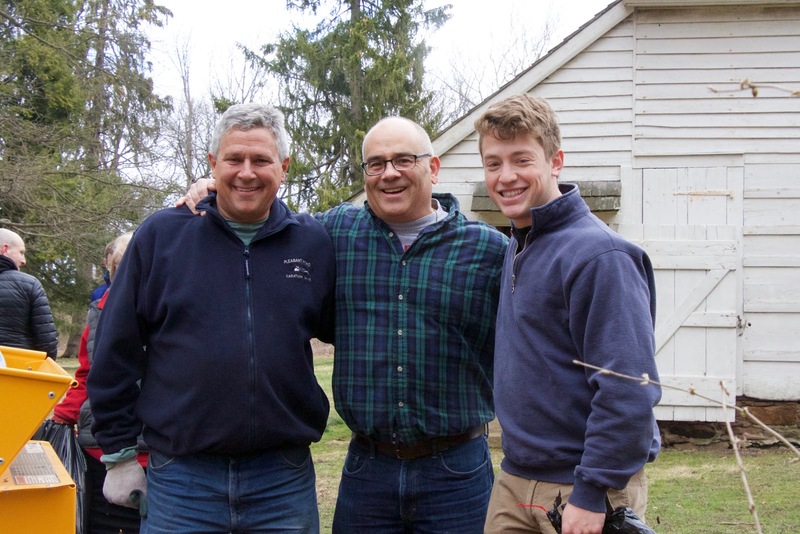 For his public service project leading up to a bar mitzvah later this year, Jensen Bergman has been helping spread seeds of native grasses in a detention basin that catches water from the Smoyer Park parking lot, across Snowden Lane from Herrontown Woods. The basin was converted from turfgrass to native meadow this past summer, and through volunteers like Jensen, our nonprofit Friends of Herrontown Woods is applying the TLC (tender loving care) to better insure success. These are seeds Jensen collected from last year's planting of Indian grass, a native of the tallgrass prairies that also is common in New Jersey's meadows. Thanks to Jensen's mother, Nicole, for these photos, including the panorama below of the basin in early spring. As we add more species of wildflowers and grasses, the basin will become an oasis of native diversity within the surrounding expanse of ballfields and mowed lawn. The deep-rooted natives should do a better job of filtering out any pollutants that wash in from the parking lot. Another project that Jensen has undertaken is the clearing of a new loop trail next to the Herrontown Woods parking lot. With signage, the trail will acquaint visitors with the preserve's ecology and the plantlife they might encounter on longer walks into the woods. Jensen's father, Jeff, has been helping as well. The Duke hat led to the realization that we share a past in Durham, NC. Clearing brush offers some perks and surprises, like encounters with charismatic snakes (below). This short loop trail had been in the conceptual stage for some time. Thanks to Jensen and his family for providing the impetus to bring it to reality. Another recent cross-generation team effort was posted at the Friends of Herrontown Woods website. Saving legacies is what Princeton Battlefield is all about, and one legacy we sought to save during a big workday organized by Kip Cherry were flowering dogwoods planted for the nation's bicentennial in 1976. I do most of my habitat restoration work at Herrontown Woods in eastern Princeton, but have been visiting Princeton Battlefield periodically to help tame bamboo monsters, care for native chestnuts and prevent vines from completely smothering the dogwoods. Having ten able and spirited volunteers at this year's Battlefield Society's Clean-up Day made real progress possible. Kip Cherry (front left) began the afternoon with a moving description of the great battle that took place there in 1777. Ten of us then headed across Mercer Street to liberate the flowering dogwood trees lining the edge of the field. The dogwood flower buds, poking through the drapery of vine growth, provided inspiration, with their promise of beauty in the spring, and nutritious berries for the birds in fall. This was the curtain of vines we cleared away with loppers and pruning shears, while dodging poison ivy and the thorns of multiflora rose. And here's the "after" shot, taken from underneath the rescued dogwoods. We worked to create an open space between ground and lower limbs so the vines cannot easily climb back up. Thanks to our brave and skillful crew, who came from near and far to liberate fifteen dogwoods over the course of three hours. I liked this pose when the work was done. As always happens on workdays, there were good conversations to go along with the physical work. I gained some Veblen House-relevant information about Long Island and Connecticut, and heard some positive testimonials about electric cars like the Chevy Volt, which combines 60 mile battery range with a backup gas engine. One owner said she'd spent only $9 on gas since last summer, and hadn't noticed any rise in her electricity bill from charging up the car at home. While restoring some history, it was good to hear the future in the form of electric cars might be at hand as well. The same thinking goes into saving legacies, whether they be dogwood trees or the world's climate. Senator Kip Bateman and Assemblyman Reed Gusciora dropped by to help out. "Our Clean-up Day was a big success! The sun peaked out, and from all reports everyone had a great time, the Park looked a lot nicer when we were done, the CWT t-shirts were well received, and the Sierra Club came through. Senator Bateman and Assemblyman Gusciora both arrived and put their shoulders to the wheel. 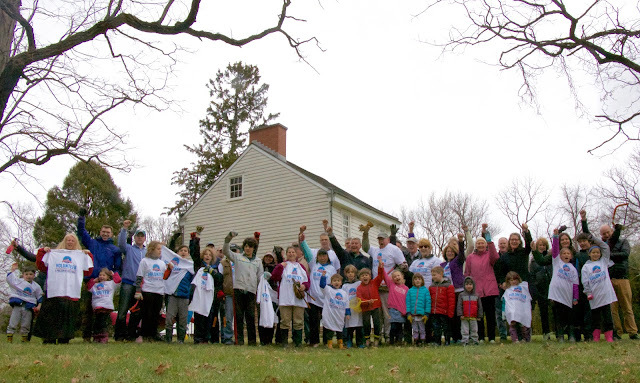 A large group of kindergartners picked up fallen sticks, while others removed invasive porcelainberry vines from dogwoods, cut down bamboo, and cleared encroachment along the pathway to the Quaker Meeting House. Special thanks to Kim Gallagher and Steve Hiltner for leading teams, and to Gary Nelson and Randy Riccardo for their hard work!" Note: Today, Sunday, April 2, we're having a workday at Herrontown Woods to plant rescued native hazelnuts, local pawpaws grown by my friend Stan, and rescued daffodils. If you happen to be free, join us! Park down the driveway across the street from 443 Herrontown Rd, or walk up from the Herrontown Woods main parking lot. A shovel or fork spade, cleaned of dirt to avoid transporting weeds, would be useful. 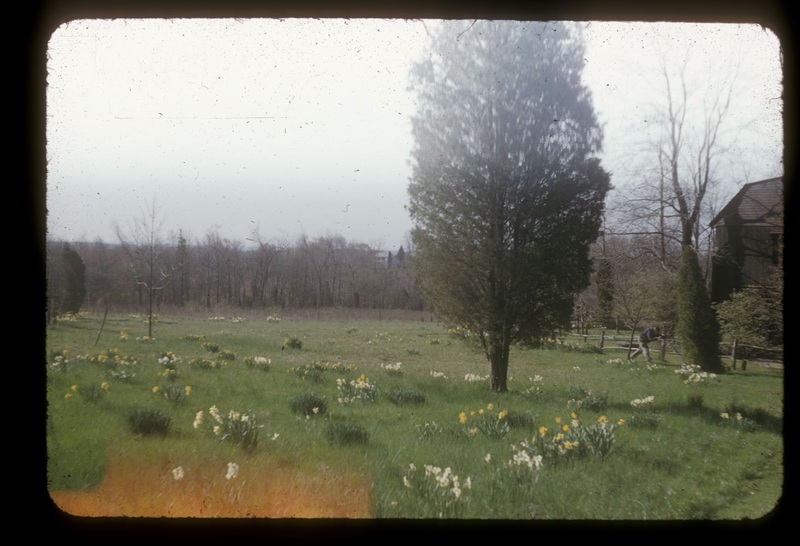 There's a tradition of planting daffodils in lawns, shown here in a 1950s photo taken of the Veblen House field. It would be a good guess to say they were planted by Elizabeth Veblen and Max Latterman, their caretaker. The field is still there, but nearly all of the daffodils are gone. What happened? Mowing is what happened. If you mow daffodils after they bloom, before the leaves have absorbed enough solar energy to recharge the underground bulb, you just get leaves the next year. That's what happened at the Princeton Battlefield near the colonnade. If they keep getting mowed too early, year after year, the daffodils disappear altogether. A couple weeks ago, the Veblen field was left deeply rutted by a couple trucks that drove down and got stuck. The trucks may have been driven by workmen hired by Mercer County. Some road salt was spilled in the lawn. In a highly symbolic act, we'll be bagging up the salt for disposal, and planting the ruts with daffodils rescued from a construction site nearby. The next step after that will be an act of not-doing, i.e. keeping the mowers away from this part of the field.